eTouch for Health is a comprehensive software tool for learning, practicing and teaching the popular Touch for Health energy kinesiology protocols. Training videos guide you step-by-step through the workshops. You can purchase each workshop individuallly or all four in a combo package. Each level is four hours and you can view at your convenience 365/24/7. homes and clinics in over 80 countries. The Touch for Health eCharts software is a digital collection of the popular Touch for Health wall charts. Now integrated into eTouch for Health. Ideal for online reference and projection for instructors and presenters. Print the chart panels for class handouts or personal reference. The eTouch Expansion Library is a collection of techniques related to TFH and EK. The mini-apps in this collection are created by people working within the energy kinesiolgy field. These apps can be installed into eTouch so that they can be accessed on the eTouch main menu through the Expand icon. Once installed, they will also active in the available techniques during sessions and session reporting. 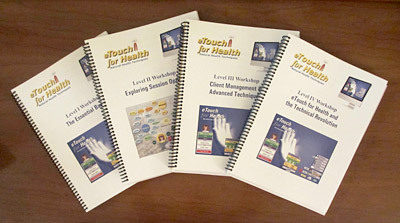 Learn to apply the full capabilities of eTouch for Health in Beginner through Advanced workshops. do not replace the IKC TFH Levels I-IV. The eTouch for Health workshop series focus on using eTouch to its full capability for learning, practicing and researching the Touch for Health protocol. eTouch is a sophisticated and comprehensive software application and has many features, facets and levels. The workshops focus on using eTouch for Health in the conduction of a variety of Touch for Health partner balances and recording results. Printed and bound manuals are available. PDFs of the manuals are also being included at no extra charge on the eTouch for Health 3 DVD. Get all four manuals bound as a single set. See below for contents of manuals.